December 9, 1961 – With plans for the new Equitable Insurance tower in place, the Chicago Tribune provides a full summary of the real estate holdings of the Chicago Tribune Building Corporation and the history of the acquisitions. 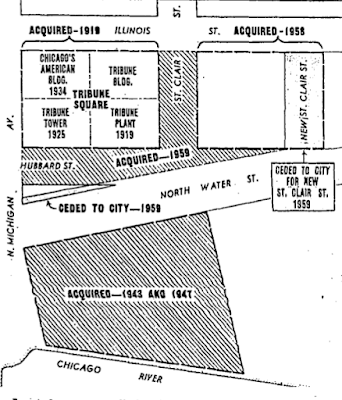 The Tribune bought its original piece of property in 1919 when it acquired a full block of real estate east of Michigan Avenue and north of the river. Immediate construction began on a six-story plant for the editorial and production departments of the paper. Six years later Tribune Tower was completed, the fourth headquarters building that the paper had occupied in its history. The tower was the culmination of a competition in which 263 architects from 23 countries submitted plans. In 1934 the W.G.N. studio building was completed just to the north of Tribune Tower, followed by an 11-story building just to the east. In 1958 the Tribune acquired 40,548 square feet of property directly to the east of Tribune Tower, and a year later the company acquired from the City of Chicago property to the south and east of the tower. As part of that transaction Hubbard Street between Michigan Avenue and St. Clair was given to the Tribune. In exchange the firm deeded land to the city necessary to widen East North Water Street to 65 feet and paid for the paving of the new street. 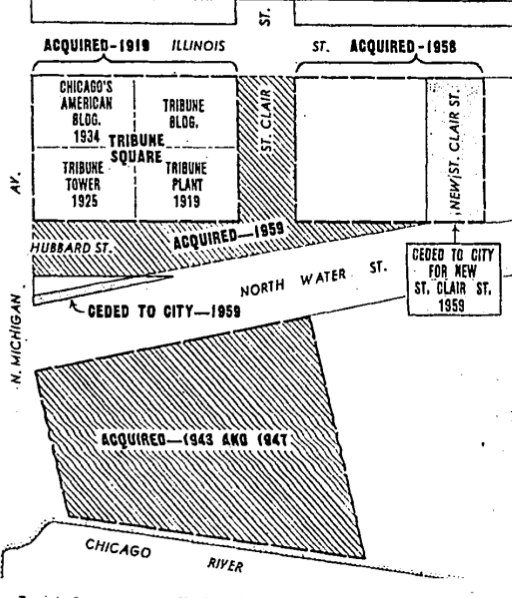 St. Clair Street, between Hubbard and Illinois, was vacated, and in exchange, the Tribune provided land for a new St. Clair Street to the east and paid for the surfacing of the new street, a plan designed to improve traffic in the area.